Asceticism without coldness, boldness without brazenness, understanding of matter as vital energy, wisdom derived from deeply sharpened senses — these are some of the characteristics defining Satoru Sato’s oeuvre. Born into a long-established Japanese family in the northern Miyagi Prefecture, this Japanese sculptor grew up surrounded by the rites, traditions, objects, landscapes and gardens informing a refined culture of age-long roots. In 1969, however, he settled in Paris and came in contact with some European avant-garde movements (Abstraction and Constructivism). This experience, together with his Asian background, determined his almost obsessive later concern with geometric abstraction, essential forms, and synthesis, void and silence. Initially a painter, sometime along the 1980s he shifted to an interest in volumetric and spatial relations. 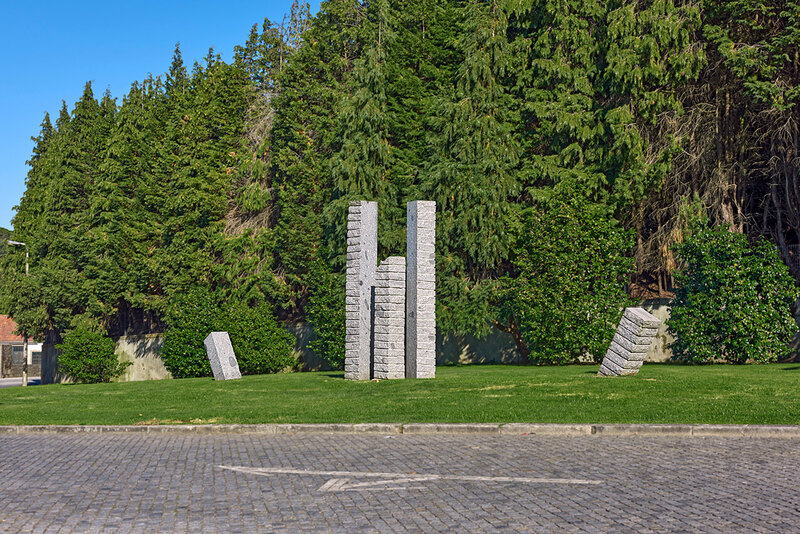 In Santo Tirso, Satoru Sato built a sculpture revealing his passion for geometric compositions of vertical and diagonal volumes. Due to a passage created by the delicate balance of those volumes, and the clear, symmetrical organisation of the piece, it demands much more than just contemplation. Viewers are thus encouraged to go through this passage and the artwork, experiencing and living the place, feeling the void in meditation. In addition, the artwork’s title points to the symbolic troubled relationship between sculpture and some natural elements, like the sun, the moon and the wind.